Well that was no fun. 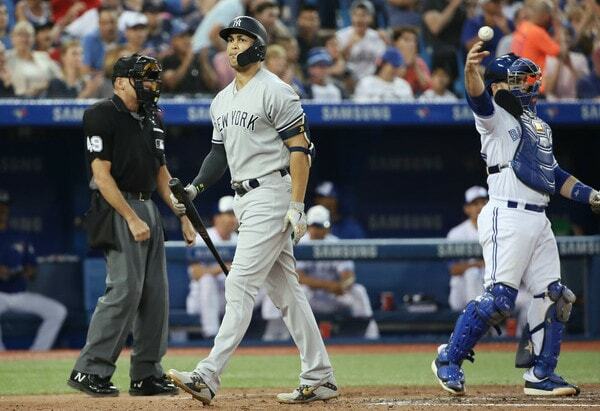 The Yankees opened their three-game series with the Blue Jays with a 6-2 loss Friday night. Sonny Gray didn’t pitch well (again) and the Yankees didn’t cash in with men on base (again). That’s how, like, 90% of their losses have gone this season, it seems. Sonny Gray hit the nail on the head following his last start: The Yankees are the best team in baseball four out of every five days, then Sonny Gray pitches. Another disaster outing for Gray on Friday night, as he retired only six of the 15 batters he faced, and the Yankees were down 5-0 before he recorded his sixth out. His strikes were meatballs and his balls were noncompetitive. Easy, easy takes. 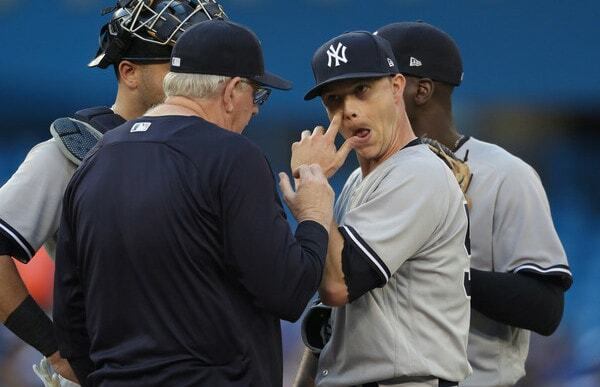 Things could’ve been a lot worse for Gray and the Yankees too. He retired the first two batters he faced, then two walks and a single loaded the bases. Sigh. Gray was able to escape that first inning jam unscathed by striking out Russell Martin. There was no escaping the second inning. Five runs thanks to singles by Devon Travis and Curtis Granderson, and a three-run homer by Justin Smoak. Sonny put an 85 mph spinner on a tee. That was it for Gray. Aaron Boone went to David Hale for the third inning. Gray’s final line: 2 IP, 6 H, 5 R, 5 ER, 2 BB, 4 K, 1 HR on 62 pitches. Sonny had his personal catcher and he was on the road. He’s run out of excuses. Gray is sitting on a 5.85 ERA (4.53 FIP) — he’s allowed 21 runs in 21 innings in his last five starts — and he really shouldn’t be making starts for a World Series contender. So what do the Yankees do now? Well, Boone already said Gray is going to make his next start, so that answers that. Realistically, the only other alternatives are the bullpen or a phantom disabled list stint at this point. The Yankees have needed another starter since the offseason. With Jordan Montgomery hurt and Gray being one of the worst starters in baseball, they probably need two starters now. Should be a fun trade deadline. Of course, even a quality start from Gray wouldn’t have been good enough to win. The Yankees mustered only two runs Friday night — and just one hit in 4.2 innings against Toronto’s crummy bullpen — and Aaron Hicks drove ’em both in. He got the Yankees on the board with a third inning solo homer. No. 16 on the season for Hicksie and a new career high. He’s been so good lately. The Yankees were able to run up Sam Gaviglio’s pitch count and they had their best chance to make this a game in the fifth inning. Austin Romine stroked a leadoff single to left, Brett Gardner slapped a single to center, and Aaron Judge reached to load the bases when Yangervis Solarte whiffed on his weak grounder. Solarte cut across and just kinda missed it. I think he was worried he’d run into the baserunner. Either way, the bases were loaded with one out. The 3-0- pitch didn’t look nearly as close on the YES broadcast as the plot would lead you believe, but I’m pretty sure it would’ve been called a strike anyway. Home plate Andy Fletcher was calling low strikes much of the night plus the 3-0 autostrike is an annoying thing that exists. Even then, Stanton chased the 3-1 pitch out of the zone and took the best pitch of the at-bat for strike three. Yuck. Didi Gregorius followed the Stanton strikeout with an opposite field line drive at Teoscar Hernandez for the final out of the inning. Bases loaded, one out, four-five hitters due up, no runs. There’s the ballgame. The Yankees went 0-for-6 with runners in scoring position and are now hitting .165/.271/.309 in those situations since June 1st. The regression to their true talent level will be amazing. Major props to Hale, who threw 75 pitches and chewed up 5.2 innings in long relief. His line: 5.2 IP, 5 H, 1 R, 1 ER, 1 BB, 1 K. The run scored in the last inning he worked too. As a reward, Hale will probably be designated for assignment in favor of a fresh arm prior to tomorrow’s game. Rough business, but I’d be surprised if the Yankees carried a long man (who they’ve cut twice already this year) for at least three days while he’s unavailable. Two hits for Gardner and one each for Hicks, Romine, and Miguel Andujar. Also, Hicks and Gregorius had hits taken away by great Devon Travis plays and Greg Bird hit two long fly balls that Pillar ran down in center. Annoying. I know no one wants to hear it, but I think the quality of Bird’s at-bats has improved considerably over the last week or so. He working the count and laying off pitcher’s pitches. Hopefully results follow soon. Romine went 1-for-3 with a walk but I didn’t love letting him hit with two on and two outs in the eighth, when he represented the tying run. Seemed like a good time to give Brandon Drury a chance to tie things up. Romine struck out looking to end the inning. Whatever. And finally, runners are now 11-for-11 stealing bases in ten games since Gary Sanchez got hurt. 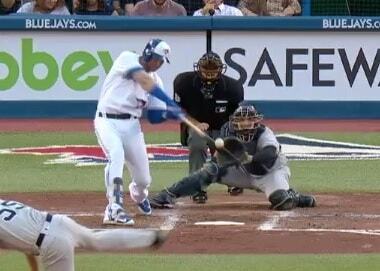 (Pillar stole second rather easily in this game.) At least they’re not passed balls? The Yankees and Blue Jays will continue this series Saturday afternoon. That’s a 4pm ET game. Luis Severino and potential trade deadline target J.A. Happ are the scheduled starters.